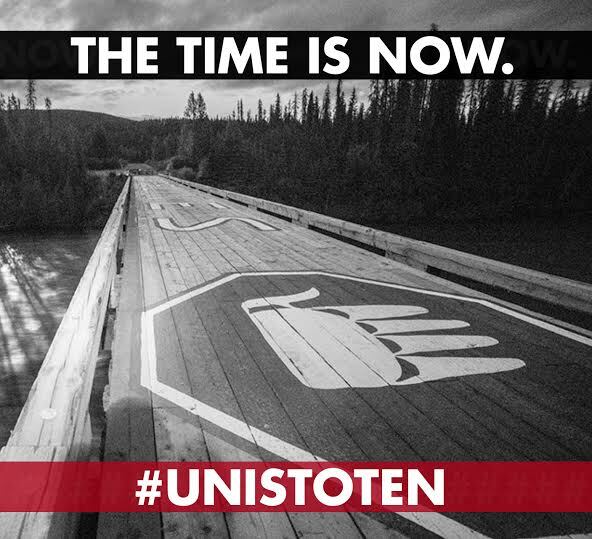 Sixty five organizations and 1527 individuals are pledging support to the Unist’ot’en Camp, demanding that Coastal GasLink, RCMP, and Federal and Provincial governments take no actions in violation of Wet’suwet’en collective Title and the United Nations Declaration on the Rights of Indigenous Peoples. The pledge was issued in advance of an injunction hearing in Prince George on December 10, International Human Rights Day. Rallies in support of Unist’ot’en Camp will also take place in Prince George, Toronto, and Vancouver. On November 27, Coastal GasLink Pipeline Ltd. served notice for a civil lawsuit, claiming financial damages for “occupying, obstructing, blocking, physically impeding or delaying access” and applied for an injunction against the Unist’ot’en Camp. “The use of legal injunctions and litigation against the Unist’ot’en is part of a long colonial history of criminalization against Indigenous peoples. As noted in a recent UN report, criminalization of Indigenous land defenders is an attempt to silence Indigenous peoples voicing their legitimate opposition to projects that threaten their livelihoods and cultures,” adds Pam Palmater, Chair in Indigenous Governance at Ryerson University. The Unist’ot’en Camp is a permanent Indigenous re-occupation of Wet’suwet’en land in Northern British Columbia, Canada. The Camp has existed for eight years and is a homestead and healing center. It is along the proposed route of multiple LNG pipelines, including Coastal GasLink. Coastal Gas Link Ltd. is a project of TransCanada Corporation. The proposed pipeline would send fracked gas from Dawson Creek to Kitimat, B.C. Signatories to the pledge include national and international organizations 350.org, Idle No More, Canadian Centre for Policy Alternatives, Civil Liberties Defense Center, Dogwood BC, Greenpeace Canada, and Secwepemc Women’s Warrior Society. Individual signatories include four B.C and Ontario City Councillors, as well as award-winning authors and artists Alicia Elliott, Bill McKibben, Desmond Cole, Isaac Murdoch (Bomgiizhik), Judy Rebick, Leanne Betasamosake Simpson, Rita Wong, Robyn Maynard, Naomi Klein and Shad Kabango.